Once it was the bustling headquarters of a vast domain. Now it is a 'historic site' with nobody to see it, more's the pity. As far back as 1682, French, English, and New Englanders were sailing their ships about the mouths of the Nelson and Hayes Rivers, which converge on Hudson Bay a few miles below York Factory. They put up posts on one or other of the rivers, traded some furs from the natives, chased one another away, burnt each other's forts. In fact they scrapped over the area for some thirty years until with the treaty of 1713 the H B C settled in permanently. Or almost permanently, for they lost out to the French once more in 1782 and York Fort was burnt down. The Company rebuilt the following year in about the present position on the north bank of the Hayes. In the first half of the next century York Factory achieved its greatest glory. Furs from the length and breadth of Rupert's Land piled up in the depot for shipment to England, and in the ships came supplies for the Factory, trade goods for dozens of posts, officers of the Company and their ladies, settlers, soldiers, tradesmen of many crafts, cattle and goats. A hundred years ago there were many buildings; the great factory itself, in the form of a hollow square, with two storeys all round and a third in the middle of the front; dwelling houses, one for the governor, bachelor halls for clerks and travellers; sheds for boat-building and for rendering oil; workshops for blacksmiths, tinsmiths, carpenters, coopers, tailors the numerous specialists needed to maintain a great trading and governing enterprise. When railways crossed the country, York Factory's day was done. It was no longer a vital port. It kept going as a fur trade post, in a region with good returns of otter, beaver, marten, mink, fox. Trapping and fishing returns have diminished in the last decades until there is no longer a livelihood for the Crees who traded at the Factory. Some continued to live on the Reserve, but treaty money and family allowances and meagre fur returns could not sustain them and the government decided that they should be moved. Some went to posts along the Churchill railway, some to better trapping grounds, and the remainder were moved to another Reserve. The old Factory was left without business and there was nothing to be done but close it down. It was always difficult to maintain the buildings for the river cut back the banks and carried them away if they were near the edge, and if they were farther back the muskeg sucked them down and the wetness rotted the timbers and there was no building timber to be had from the stunted local trees. So when the post was abandoned there were few buildings left, apart from the massive factory itself. The only other remains of Company activity were the long boat-building shed near the spot where the wharf had once jutted into the river, a small square log building, and the manager's modern house. Between factory and river were some large iron tanks, once used for whale oil, a broken flagpole, a solitary cannon and a half-buried anchor. Half a mile away in the little cemetery that is sliding into muskeg and creek were the broken walls of the stone-built powder magazine. Beyond, in a willow thicket, lay a rotted boat and two huge anchors. 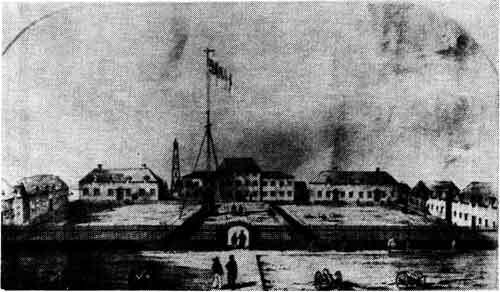 York Factory in 1853. The central building, in the form of an open square, is the only one that remains. The foundations of the factory had been renewed in the 1920s and now it stands proudly alone, square and solid, dominating the flat swamplands. The store had occupied a corner of the building and part of it was used for storage, but most of the big halls with their mellow spruce panelling had long been empty. The halls were swept, the many-paned windows boarded up, and the heavy doors barred. Post Manager A. B. Mclvor turned the key for the last time, and 275 years of history is no more than a name on the map.